There’s a village, The Aerie, which your character visits at the beginning of Nier. Its cacophonous theme is....surprising. As part of my never-ending battle against my backlog, I decided to finally play 2010's Nier in preparation for the new game in the series, NieR:Automata. I’m about 15-20 hours in, so that’s not too far. During that time, a few things have stood out. The first, most obvious one, is the face of the father that only a Yonah can love. The second is that the fishing game is just awful. I’m learning that this is a much hated aspect of the game in talking to friends about it and by what the Internet says. I’m also told that I’ll need a walkthrough to help me catch sardines as part of unnecessary sidequests, unless I really want to just keep pulling up oversized cans and boots. I have no clue where those are going once I fish them out of the water. I’ll just imagine I’m doing my part by throwing them in the garbage, Animal Crossing style. What I was not at all expecting was this third curious thing—an auditory equivalent to a slap in the face. I’ve been told countless times over the years that I had to play Nier, if even just to hear its lauded, glorious soundtrack. Why did no one warn me that this one particular piece was waiting around just to upset me? It starts beautifully enough, doesn’t it? There’s a slow build with quiet harmonies followed by the creeping, deliberately slow interjection of layered voices. Then it’s all tempered briefly for a rousing, powerful entrance of drums and heavy vocals that begin blaring. It’s pretty damned great! Except you don’t quite get the luxury of enjoying it when playing the game. When first setting foot in The Aerie some weeks ago, that gorgeous 45 second intro plays over a disconcerting cutscene that pans around The Aerie. 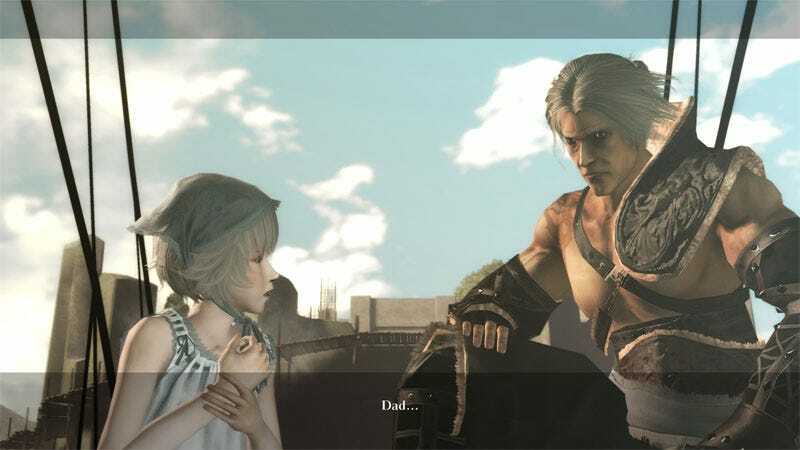 By the time you’re given control again, a conversation starts and Nier immediately throws you into a non-stop battle fest on your way along the village’s narrow pathways and bridges. Through of all of this, all I absorbed and remember of this section of the game was being hit with the composition when the chorus was already in full swing—all elements playing together loudly and overwhelmingly forceful. It was a din, if ever I heard one. That is of course, the point of The Aerie. It’s a village with cylindrical huts clinging high and dangerously on cliff walls which is overrun by demons in Nier’s world, called Shades. I haven’t met this dapper fellow yet. Can’t wait. It’s a desperately bleak game, corrupted by Shades and a mysterious illness called the Black Scrawl encroaching on the inhabitants and locales in Nier. The Aerie and its people are no exception. Their fear can be heard in all the strong notes the theme carries. There’s anger mixed in with uncertainty. As your protagonist nears their huts, the villagers will spew venomous words blaming your presence for that of their increasingly dire situation. The theme is such a great use of music to emphasize all of that raw, hateful and pitiful human emotion. Entering the village took me by surprise, and I honestly couldn’t handle how jarringly fantastic every element in the scene came together. Scaling the ladders, fighting off the Shades, and the abusive words of the villagers all aided to agitate my senses, with the weight of the theme serving to amplify the unbearable feeling of confusion belonging to The Aerie. While I’m not done with Nier just yet, if the soundtrack is anything to go by, I’m expecting a lot more greatness to come. I’ll take whatever further insanity it brings me, too. Narelle is a freelance writer with a New York State of Mind. She's an admin of Kotaku's TAY Blog, where she can be found musing about JRPGs, music and doing this ಠ_ಠ. Reach her on Twitter. What&apos;s Your Greatest Gaming Comeback Moment?